✔WIDE APPLICATIONS&IDEAL GIFT CHOICE: Decorating walls, mirrors, photo frames, trays, fish tanks, plates, flowerpots, cups and other handmade DIY crafts; Ideal Birthday Christmas gift choice for your friends and children, as this mosaic tiles set can evoke and excite their imagination and creativity, and exercise their brain and handmade ability. ✔MIXED COLOR MOSAIC PIECES: These exquisite mosaic tiles compose of more than 20 kinds of color, such as red, pink, orange, yellow, green, cyan, light blue, dark blue, sky blue, purple, white, black and so on. The Mosaic tiles set includes 2 kinds glass mosaic pieces, stained mosaic and transparent colorful mosaic tiles. 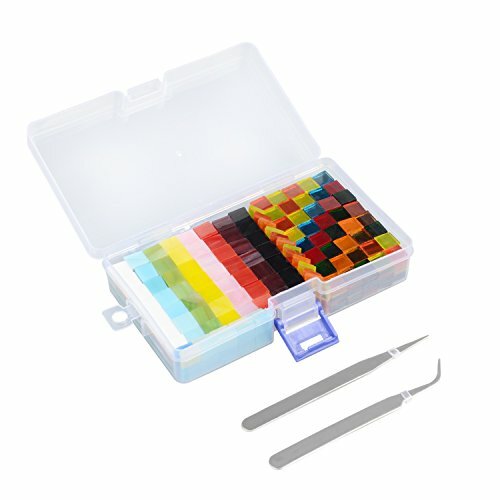 ✔EASY TO NIP&DIY: We provide extra two kinds of tweezers to you for better nip and DIY the mosaic tiles, one with straight tip and the other with bent tip for your choices. As the Mosaic tiles are with sharp edges, so it is better to use tweezers to nip mosaic tiles to avoid the hurt of your hand when you create a mosaic. Kindly Note: Small parts, not suitable for children under 3 years old; Keep away from little children. ✔SHAPE, SIZE&MATERIAL: Square shape, 1cm by 1cm, approx. 0.25cm thickness, made of sturdy and innoxiously glass, these mosaics in gentle colors will not lose their colors, so they are suitable for making DIY crafts and home decorations. If you have any questions about this product by Aestheticism life Museum, contact us by completing and submitting the form below. If you are looking for a specif part number, please include it with your message.